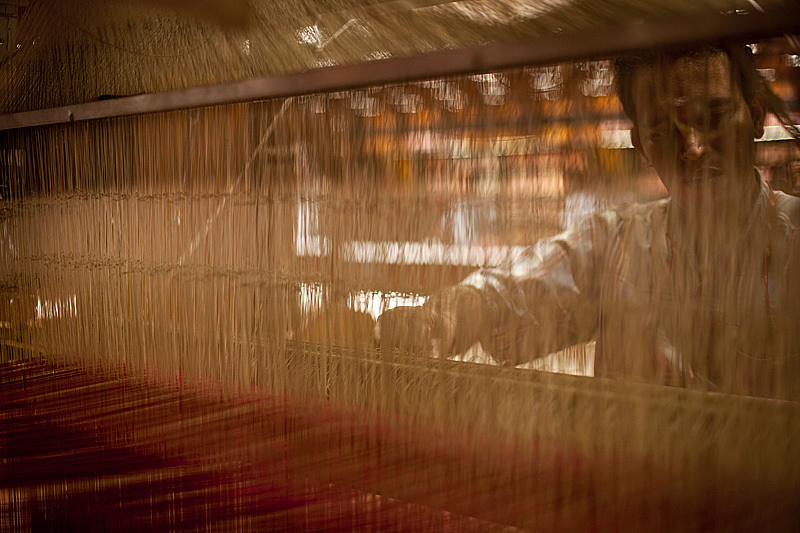 A saree weaver is seen through the white strings of a handloom. Yesterday I mentioned RmKV, a major textile company and silk saree department store in south India. I was given permission to photograph their other super-store about 12 hours away from Chennai in a city called Tirunelveli, near the southernmost tip of India. Permission was granted on the condition that they have non-exclusive access to any usable photo I produced. There always seem to be strings attached for an unestablished photographer. However, I was happy to agree considering how much unrestricted access to the store they gave me. 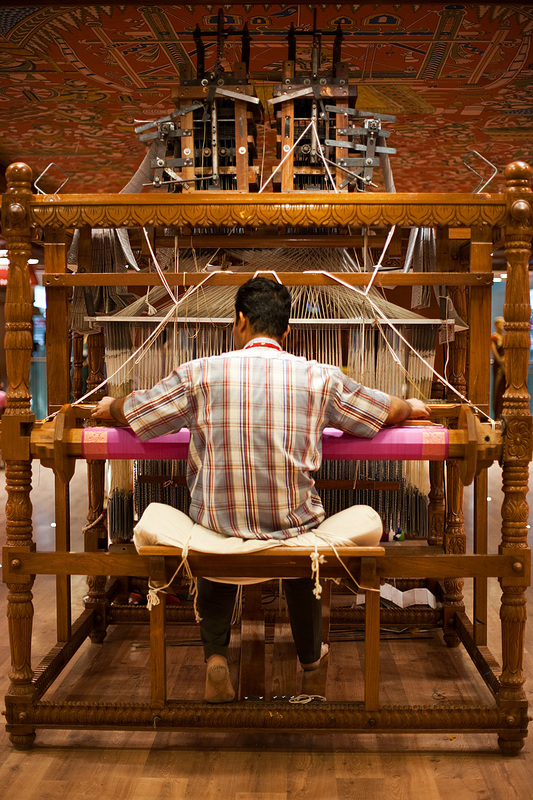 A weaver creates a saree work of art using an extremely intricate handloom. In the center of RmKV's superstore, there is a fully operational handloom and a weaver who works meticulously to create a silk saree millimeter by painstaking millimeter. It's a fascinating process that I was able to observe over the course of three full days. I even had a chance to learn how the intricate patterns and designs are created by climbing the loom to study the system of key cards located above the contraption (more to come about this tomorrow). The silk piece currently in the loom will take approximately 45 days to finish and sell for around 10,000 Indian rupees (US$222). Frankly, that price is a bargain considering how much work goes into the production of one of these beautiful pieces of clothing. 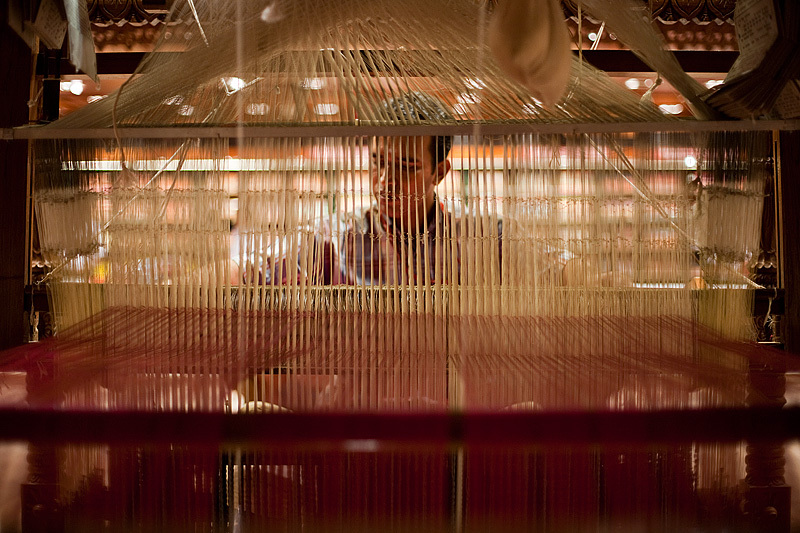 The weaver is seen through the white operating strings of the handloom. The white strings shown here form part of the web of cords necessary to manipulate each individual thread of design silk. Ultimately, the white strings enable the weaver to integrate certain designs into the body of the saree. The pink strings below are the silk threads that form the actual body of the saree. Located at the far ends of the contraption are finer white cords that manipulate another set of design threads. These white cords enable the weaver to form the intricate border design seen on all fancy silk sarees. Beautifully captured... We are doing a documentary on silk weavers in tamil nadu. will you be able to share the high res images for the above pictures? do let me know how we can go about this. thanks!